I joke sometimes when I say that Austin is starting to look like a real city. What I mean is that we are actually getting some downtown density, with substantial skyscrapers filling once underutilized parking lots. Ten years ago, this exact view would’ve been of open sky. Unlike the totally boring and value driven buildings of the past, we’re getting some texture and architectural interest. I emphasized the details here and compressed the buildings together by using a moderate 60mm equivalent telephoto. I took artistic liberty by adding extra blue, which will match this newest mini-series theme. But more importantly, it adds some interest to uninspiring light. Another option is to turn it black and white, which will also emphasize texture. But, I’ve been posting a lot of black and white monochromes lately, and I was open for a change. I like the blue. It makes it look shiny, almost lit from within. Thank you, Marilyn. 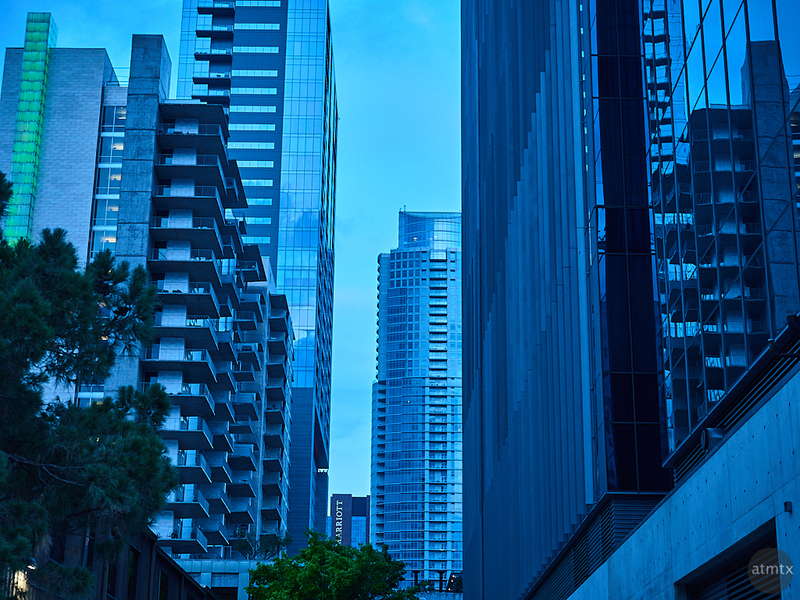 I also think blue, with its implications of loneliness, can match the impersonal nature of a downtown.